The Therapy House by Julie Parsons won Crime Fiction Book of the Year at the Bord Gáis Energy Irish Book Awards 2017. Set in Dun Laoghaire, it’s the story of two murders, one set in the present, one dating back many years. The crimes are linked through retired Garda Inspector Michael McLoughlin who discovers the body in one case and whose father was the victim in the other. McLoughlin will be familiar to anyone who has read Parsons previously. He first appeared in her debut novel, Mary, Mary. In The Therapy House, McLoughlin has retired and is now working as a private investigator. The novel opens strongly with a beautiful description of Judge John Hegarty who is getting ready to go to church. But Hegarty is about to be murdered. The question is by whom? And why? When McLoughlin discovers Hegarty’s body, this story line takes off but it never really becomes a page turner, partly because so many characters are introduced that it is difficult to keep track of who’s who, particularly as not all of them move the story forward. The second killing took place many years previously when Jim McLoughlin, also a Garda, was shot during a raid. No one was held to account for the killing but McLoughlin knows who did it and he knows where the killer now lives. The question is, what will he do about it. As both story lines develop, it emerges that there are links between the two crimes. Ultimately, though, I found The Therapy House a frustrating read. Repeatedly, just as I becoming interested, a chapter would end only for new characters to appear in the next chapter. This lack of continuity became increasingly annoying as I got further into the novel. That said, there is a lot to think about and talk about in this novel which might make The Therapy House a good choice for book clubs, particularly those with an interest in Irish crime fiction. I first came across Julie Parsons a few years ago when I read The Guilty Heart, a thriller about a father whose son disappeared. 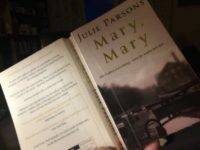 Then, a few weeks ago, I saw a review of The Therapy House, which reminded me that I always meant to read more Parsons work so, I had a look in the local library and found her debut novel, Mary Mary. Published in 1999 and set in Dublin, Mary Mary is a crime thriller. It begins when Margaret, a psychiatrist, calls the police because her daughter Mary is missing. The police think Margaret is overreacting until Mary’s body turns up in a canal, battered and lifeless. As the hunt for Mary’s killer gets underway, questions arise about Margaret’s background. Who is Mary’s father? And why does Margaret not tell the police when she receives threatening phone calls? Investigating the case is Detective Inspector Michael McLoughlin whose marriage is on the rocks and who develops an intense interest in Margaret. There are a lot of layers in Mary, Mary. Julie Parsons spins a complex plot and writes beautifully. But I found it difficult to sustain interest in the characters, particularly in the first part of the book. And sometimes the descriptions of what the characters observe as they move around Dublin are a distraction that don’t seem to move the story forward. Part 2 is more engaging and produced unexpected twists as the story drew to a conclusion. Although Neil White is a bestselling author, I hadn’t come across him until I saw From the Shadows on Netgalley. What drew me to the title was the description — “a gripping thriller”. In fact, it’s part murder mystery, part crime fiction, part thriller, part courtroom drama. All of which amounts to a good read once the story gets going. When criminal defence lawyer Dan Grant is asked to take over a case from another firm, he suspects there’s something unusual about the case. Robert Carter is accused of murder. The court case is just two weeks away and Dan is supposed to just turn up, defend the client, and get paid. But that’s not Dan’s style. He wants to do his best for Carter, and that means investigating the case. Carter’s best chance of getting off is if Dan can show that someone else had the opportunity to commit the crime. Time is very short so Dan needs help to build a case. He hires a former client, investigator Jayne Brett, to do some of the legwork. Once they begin to look into the case, they find that Carter is not the murderer. But everyone, including Carter, is reluctant to tell what they know and, before long, Dan and Jayne find that uncovering the truth is a dangerous game. Once they’ve started, however, they can’t let go until the job is done. After a strong opening, From the Shadows takes a while to pick up pace. A couple of chapters in, it seems to settle down and from there on it’s a fairly engrossing read. Dan and Jayne are a well-matched team and far and away the best characters in the novel. I’d happily follow them through further novels if White turns this into a series. That said, Neil White could have made From the Shadows a stronger story with a bit more insight into the background and motivations of the other main characters. I’d like to have known more about Shelley, the solicitor who worked on Carter’s case before Dan took it over. What did she find out and who did she upset in the process? How come her firm’s conflict of interest only became an issue so late in the case? There was also scope to provide more detail on some of the other key players in this story — particularly the baddies. Nevertheless, From the Shadows is a decent read. If you like crime fiction, murder mysteries or courtroom dramas, keep an eye out for it. From the Shadows by Neil White is published by Bonnier Zaffre. I read a Netgalley ARC.